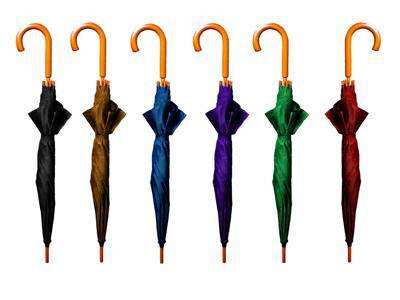 Today is National Umbrella Day. When I read this I was delighted. I really enjoy using an umbrella. I own a number of them. Why I hear you ask? Surely I only need one? No not really. I have a silver one which I purchased in Oxford while on holiday and the inside depicts the constellations of the northern night skies. I would never have chosen it myself but my husband found it and re introduced me to the night sky. I have a red polka dot umbrella given to me as a birthday present and whenever I use it, which is often if you are living in Ireland, I always find myself twirling the umbrella and singing to myself. On any grey wet windy day beside the sea it is a splash of colour. The only draw back to this umbrella is that it doesn’t fold up. So that meant that I had to keep an eye out for a fold up umbrella for my bag. There are the basic ones which will do the job but…..A few years ago while on a visit to the National Art Gallery in Dublin, I came out to a down power. The Gallery shop had umbrellas, books, more books so many items that by the time I had chosen and purchased the umbrella the sun was shinning when I came out. The umbrella is based on a Monet design and I have to tell you that nine times out of ten when I have that umbrella in my bag it does not rain, but then again there is that one time when it is invaluable. It was the Chinese who developed the waxed leather umbrella for use by the nobility to protect from the rain in the 11th century B.C. While parasols were used in Egyptian and Roman empires the custom fell into disuse after the fall of the Roman Empire. I was amazed to find out that the umbrella dated so far back. 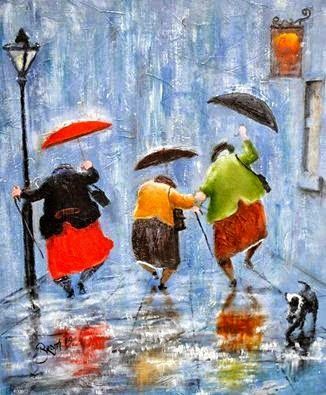 This painting by Des Brophy is one of my favourite paintings. This morning on a craft group which I follow on social media a member made the suggestion of drilling holes into flat beach pebbles to use as unusual buttons. I immediately recalled my grandniece, 3 years of age after a walk along our pebbled beach. We had thrown pebbles in the sea, chosen many pebbles which she had entrusted to her older cousin to mind. But when we came to the end of our walk she insisted that all the pebbles had to be returned so that other children could throw pebbles in the sea. Out of the mouths of babe…. Sometimes it is the pebbles on the beach which make that particular beach so beautiful. Those pebbles are needed to soothe the souls: to make the unique sound of the sea washing over them: to provide that feeling one gets no matter what age when throwing them back into the sea. So perhaps if you contemplate taking pebbles from the beach as a memory, or for use in an art project perhaps pause and ask yourself if you really need it?